For entering students, university is a drastic change from the good old high school days. Following Frosh leaders and fellow Froshies to the SAQ store is, essentially, an initiation into the adult world. Long gone are the parental wake-up calls and the mandatory school activities. Some will breathe a sigh of relief over not having any more 8:30 a.m. classes. Freedom at last! But to paraphrase Spiderman’s Uncle Ben, “With great [freedom] comes great responsibility.” This almost seems like a no-brainer, but at some point, students will inevitably skip their first class. Whether it’s because of the existence of lecture recordings, a long night at Gerts, a sleep-inducing professor, or some other semi-legitimate reason, there is no point in delaying fate. University requires independent study, motivation, and class attendance, all of which will greatly influence one’s academic career at McGill. Sitting in lectures, be they large or small, is a great way to make friends with whom one shares common interests. Yes, students meet a lot of friends in residences and at orientation, but different schedules and interests will eventually lead many to go separate ways. Attending class is a great way to meet people outside who fall outside one’s echo chamber, and who can help each other when stuck on things like Webwork. University requires independent study, motivation, and class attendance, all of which will greatly influence one’s academic career at McGill. Furthermore, research has shown that there is a strong correlation between class attendance and the grades students receive. Why? Because making oneself attend an 8:30 class requires discipline—sort of like going to the gym. If you skip a Math 140 class and attend the next one, you might look at the chalkboard and ask, “what do these greek letters mean?” This feeling of disarray is usually the wake up call for students to get their act together, and salvage the salvageable before the next midterm or final. University moves at a much faster pace than high school. Even though the number of classes might be less than the amount taken in high school, university courses tend to cover topics in much greater depth. Depending on one's program, homework may no longer a big component of one's grade. Regardless, attending class is still very important for academic success: Lectures serve to keep students up to date and engaged with the material. 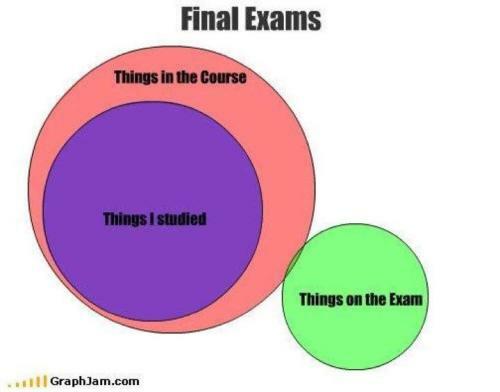 It’s not surprising that there are a lot of Facebook memes with pie charts comparing the large proportion of ‘stuff studied for’ and the teeny-weeny per cent of ‘stuff actually on the exam.’ Students may expect to be tested solely on homework problems or lecture notes—a habit synonymous with a learning style developed in high school—but professors will not spoon-feed material. At the end of the day, some classes reward hard work; others demand brilliance. But, don’t be discouraged! Most professors will gladly talk to students and meet one-on-one during office hours. It is important to remember that all professional academics were once undergraduates, too. Professors want their students to succeed, even if students disagree at times with their pathway to success. Students will of course continue to file their grievances to Spotted: McGill, but this still isn’t an alternative to going to class.